Kamloops, BC – Pittsburgh Penguins prospect Jordy Bellerive (Lethbridge Hurricanes) scored the third period game winner as Team WHL took a 2-1 victory in Game 1 of the 2018 CIBC Canada Russia Series at the Sandman Centre in Kamloops, BC. 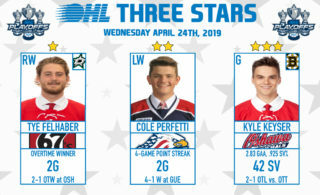 The closely-matched contest saw Russia outshoot the WHL for just the third time in the 16-year history of the event, taking a 28-23 edge in the shooting column as Toronto Maple Leafs prospect Ian Scott (Prince Albert Raiders) made 27 saves for the win. Entering action with a point in all 17 games he’s played this season, Brett Leason (Prince Albert Raiders) stretched that streak to 18 when he set up Bellerive for the game winner at 10:31 of the third period. “It seems to be a lucky building for me,” Bellerive said of his goal. “We were just entering [the zone], [Trey Fix-Wolansky] made a good play to put it low. 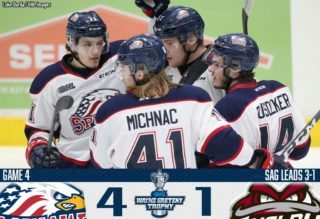 After a furious pace opened the first period, the two teams exchanged goals as top 2019 NHL Draft prospect Dylan Cozens (Lethbridge Hurricanes) opened the scoring for Team WHL. Jett Woo’s (Moose Jaw Warriors) point shot attempt was blocked, causing the puck to fall loose in the slot where a waiting Cozens snapped it past Russia’s Daniil Tarasov with six minutes to go. Russia needed just 26 seconds to draw even though as captain and Boston Bruins prospect Pavel Shen wristed a clean shot past Scott off the rush. Stepan Starkov drew the lone assist on the goal as things were knotted at one after one. Things slowed down in the second but Tarasov used his big 6-foot-4 frame when called upon to keep the score even into the third period where WHL scoring leaders Leason and Trey Fix-Wolansky (Edmonton Oil Kings) helped break the offensive silence. 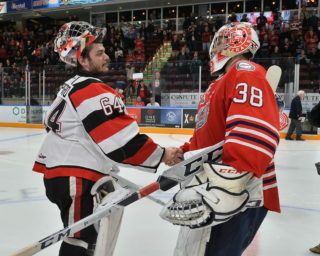 Stationed to the left of Tarasov’s goal, Bellerive put a quick release on a Leason pass from below the goal line, snapping a shot inside the far post past Tarasov as 4,438 at the Sandman Centre looked on. Team @TheWHL takes Game 1 of @CIBC #CANvsRUS Series 2-1. A late Russian penalty would stall their comeback momentum as Team WHL held on for a 2-1 win, giving the CHL a 3-0 series lead in points to start things off. Russia’s Daniil Tarasov made 21 saves in the loss, keeping victory within his team’s reach with a number of high quality saves on the night. Vegas Golden Knights prospect Cody Glass (Portland Winterhawks) earned Player of the Game honours for Team WHL, registering four shots on goal in the win. Russian goal-scorer Pavel Shen was recognized with Player of the Game honours for his club. 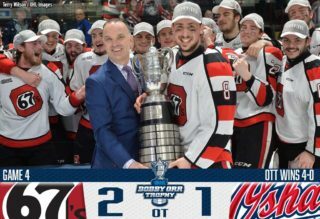 The CHL has now won the opener in nine of the 16 years the series has been played, and has gone on to claim victory in the event in each of the eight past instances. Team WHL returns to action on Tuesday at the Langley Events Centre as Vancouver Giants standouts Bowen Byram and David Tendeck will play from the comforts of home when the puck drops at 10:00 PT/7:00 ET on Sportsnet.